Join the Cambridge Writers’ Workshop on our Summer in Barcelona & South of France Writing Retreat to two of Europe’s most fascinating and evocative locales, Barcelona, Spain and Narbonne, France. A little more than a two hour’s ride away from Narbonne via train, Barcelona, known for its award-winning architecture, beautiful weather, and rich European culture, is the perfect spot for any writer looking to indulge in a feast for the senses. The Sercotel Amister Art Hotel Barcelona, where we will be staying, features beautiful contemporary art, along with a very modern classroom space which will surely get those creative juices flowing. 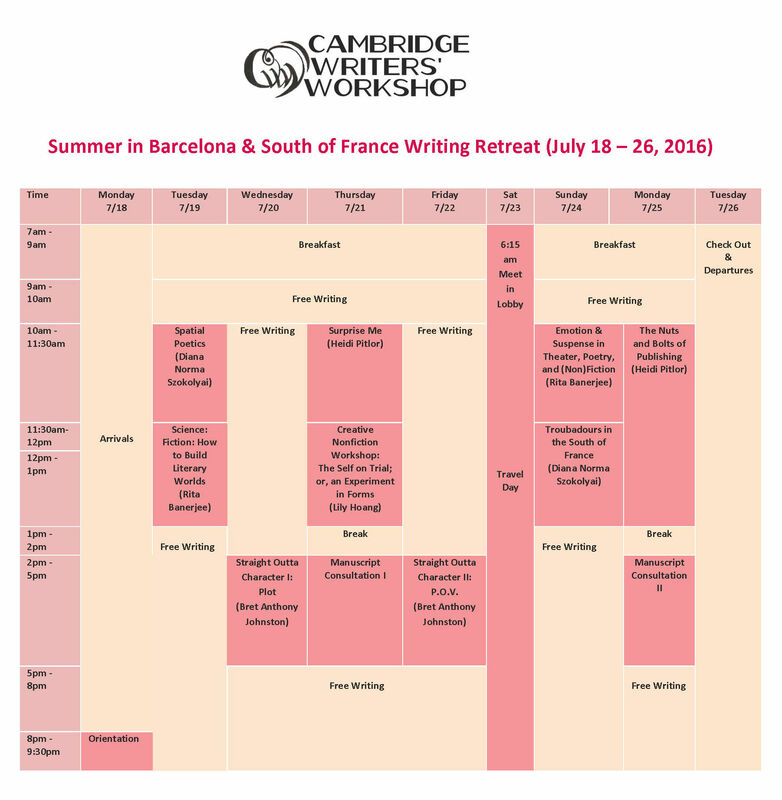 The Cambridge Writers’ Workshop Summer in Barcelona & Southern France Writing Retreat will take place from July 18-26, 2016, and the cost of the workshop is $3950*, which includes lodging and breakfast in Barcelona, Spain and Narbonne, France, transportation from Barcelona to Narbonne, craft of writing seminars, and writing workshops. The retreat allows writers, both new and experienced, the opportunity to learn from and work alongside award-winning authors and editors. Participating writers will find themselves honing their craft and expanding their writing skills as they work on existing or brand new projects. The retreat will be held at the Sercotel Amister Art Hotel Barcelona (Avinguda Roma, 93-95, 08029 Barcelona, Spain) and Hotel Novotel Narbonne Sud (130 Rue de l’Hôtellerie, 11100 Narbonne, France). Faculty includes Bret Anthony Johnston (fiction), Heidi Pitlor (fiction, publishing), Lily Hoang (nonfiction, poetry), Diana Norma Szokolyai (poetry, nonfiction), and Rita Banerjee (poetry, fiction). If you’d like to join us in Barcelona and Narbonne, please apply online at cww.submittable.com by May 30, 2016, and include a $5 application screening fee, along with a writing sample of either five pages of poetry or ten pages of prose. (Due to limited seats, early applications are encouraged, but check for rolling admission after deadline, depending on availability). In this course, we’ll discuss everything from how to write a query letter to what editors are seeking to the varying timelines in magazine and book publishing. We’ll talk about the importance of soliciting useful feedback to the revision process and how to know when a piece is finally finished. We’ll learn how to guard against the disappointments of rejection and will look at the struggles and rejections of ultimately successful authors. Come ready to talk about your own experiences, if you’ve got them, and with plenty of questions. How can we keep our readers– and ourselves–fully engaged in our fiction? How can we better utilize the unexpected to energize our fiction both in terms of language and story? What are the enemies of surprise– and vitality–when we are writing short stories and/or novels? In this course, we will examine surprising linguistic choices and sections from some stories that have appeared in The Best American Short Stories, and discuss ways that we might inject our own writing with more unexpected moments. To essai is to trial, to experiment. For this workshop, students will be asked to submit essays that put the self on trial while pushing at the boundaries of what creative non-fiction can mean (e.g. lyric essay, fabulist non-fiction, etc). To put the self on trial means constant and urgent honesty, one that reveals as much terror as effulgence. For writers who have inquired about scholarships and discounts for our summer programs, we are offering the following discount options. This year, writers can also enjoy the full retreat program for $2950 with a shared lodging option. Writers can also attend the program for a retreat & manuscript consultation-only option (with private room) for $2450. Both options include breakfast and one-way transportation between Barcelona and Narbonne. How do I get to and from Barcelona? Passengers may begin booking their tickets for the TGV from Narbonne, France, to Barcelona, Spain, on March 29, 2016. One way tickets from Narbonne to Barcelona typically cost between $32 and $56. Trains typically depart four times per day and take two hours to arrive in Barcelona. Trains from Narbonne depart at: 10:30 a.m., 2:38 p.m., 5:35 p.m., and 6:34 p.m. Train tickets can be purchased at loco2.com.